AVL is the world’s largest privately-owned company for the development of powertrains (combustion engines, hybrid systems, and electric drive) as well as simulation and test systems for passenger cars, trucks and marine engines. AVL Software and Functions in Regensburg (AVL SFR) was founded 2008 as a 100% daughter of AVL Graz. Within the AVL group AVL SFR is the worldwide competence center for software and electronics. 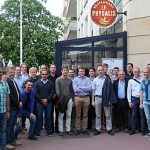 Mainly highly experienced engineers for automotive software, function and electronic development are with AVL SFR (~500 employees). AVL SFR is fully embedded in the AVL network for all disciplines and areas. For electric mobility, AVL develops highly innovative systems and detailed solutions. One example of AVL SFR’s developments is the coup-e 800, a project which was realized in-house. Its high-voltage architecture was implemented consistently from the battery design to the inverter and electric motor drive. This was a first step towards the market of high-efficiency propulsion for cars and commercial vehicles. However, several compromises have to be taken into account, because of missing components according to the automotive standard (especially in power electronics). This vehicle and its highly innovative technology was awarded the Bavarian State Prize in the category eCarTec 2012 Design. (Winner in the category “Drive Technology, System Electrics, Testing Systems”: Coupe 800 – AVL Software and Functions GmbH). In the automotive industry, AVL SFR is a very well-known and accepted partner for many OEMs and Tier1s worldwide, it is involved in projects from the concept phase up to serial development.